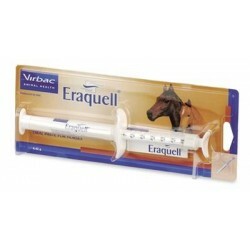 Eraquell There is 1 product. Eraquell is a horse wormer containing the active ingredient ivermectin which kills more roundworms and bots than any other worming ingredient including large redworms. Effective against small redworms, pinworms, large roundworms, threadworms and hairworms.